Our next book – Margaret Atwood’s The Handmaid’s Tale – is a gripping read, but it won’t make you feel comfortable. It is set in a dystopian future where a society (which was once clearly the USA) is ruled by a fundamentalist religion that controls women’s bodies. Because fertility rates are low, certain women – who have proved they are fertile – are given to the Commanders of the ‘Republic of Gilead’ as ‘handmaids’ in order to bear children for them when their wives cannot. The novel purports to be the first-person account of a handmaid, Ofred, who describes her life under this totalitarian regime. Flashbacks to her past, when she took it for completely for granted that she could be a working mother and have an equal relationship with her husband, show how easy it was for women’s rights to be revoked once a period of social chaos arose. As tension builds, the reader desperately hopes that the underground resistance will come to Ofred’s aid and rescue her. Well, here's our chance to read beyond the ‘tag’, and share our thoughts about how we think its dystopian vision relates to the world of 2017. 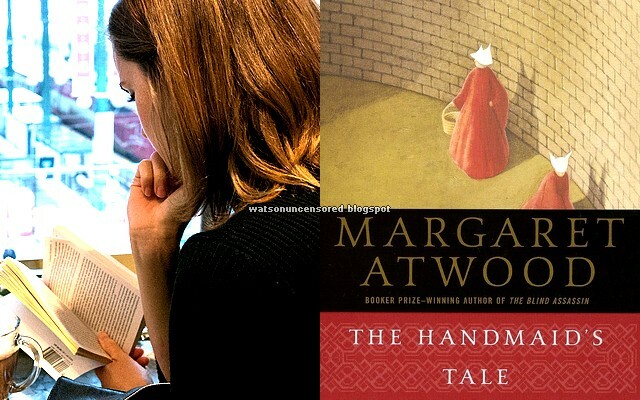 Atwood has called it ‘speculative fiction’, but also says that all the practises described in the novel are ‘drawn from the historical record’ – i.e. are things that have actually taken place in the past. Could any of Atwood’s speculations take place again, or are some of them taking place already? Are the women in the book powerless in their oppression or could they be doing more to fight it? I can’t wait to hear your thoughts. Now waiting for her selfie.